Although primary amyloidosis is rare, oncology nurses have a broad range of responsibilities in managing patients who develop this disorder, researchers said. President Obama guaranteed Americans that after health reform became law they could keep their insurance plans and their doctors. It’s clear that this promise cannot be kept. Insurers and physicians are already reshaping their businesses as a result of Mr. Obama’s plan. Nilotinib: First-line Treatment Option for Chronic-phase CML? 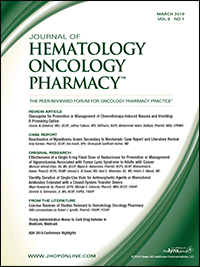 In the first head-to-head comparison of targeted oral tyrosine kinase inhibitors as initial treatment for early-stage chronic myeloid leukemia (CML), molecular and cytogenetic remissions were more common with nilotinib compared with imatinib, the previous standard for treating early-stage CML, said Giuseppe Saglio, MD.